No, really, please do; it seems to be some organized form of Calvin Ball. A strike zone, which the batter ("batsman", always, even if the batsman is female) defends from the pitcher ("bowler"). In baseball, this is an area loosely defined by the umpire. In cricket, it is the area defined by those three wooden sticks in the ground: the stumps, a.k.a the wicket. When the ball hits the stumps, that‘s an out. The batter hits the ball to score runs and is out if the hit is caught on the full. Further is usually better, and hitting the ball into the crowd brings the most runs with no possibility of getting out. Cricket allows hits through the full 360 degrees around the batter. There are essentially two ways to score runs; hit it far enough that it gets to the edge of the pitch for free runs, or running between the two sets of wickets. At the end of the game, whichever team scores the most total runs wins, providing certain conditions are met: see below. Also note: a team is referred to throughout in the plural; thus, "Bangladesh aren‘t winning", rather than "Bangladesh isn‘t winning". This is standard in British (and by extension Commonwealth) English to describe sporting teams etc. -- e.g. "The team are on the field" (all members of the team); "the teams are on the field" (both teams). The game is played with two teams of 11 players a side. Each game begins with a coin toss, and the successful captain chooses whether to bat or field first. Cricket is a summer sport, ergo (in Britain at least) at around this point it usually starts to rain. In cricket a batter is normally termed a batsman (not Batman), the person hurling the ball at him is the bowler, and the remainder of the bowler‘s team dotted around the field are the fielders. The batting team must always have two players on the field at any one time, so as soon as the tenth player is out they've only got one left and they are all out (although this isn't marked against the leftover player, who is said to have finished not out) and it's time to let the other team have a bat. In what might be called the ‘standard‘ form of the game there are two innings per side with 10 outs (wickets) each. It‘s "an innings", too: cricket never uses the singular "inning". These matches (games), the classic ‘genteel English‘ sport, last for up to four days at county level, the main level of domestic professional play in Britain, where the prestigious County Championship is fought over in league format -- days feature at least six hours play each, with lunch- and tea-breaks built in since this is the Commonwealth. At international level, where they are known as the Test matches (as in "test of endurance/willpower/sanity"), it is up to five days. The winning team is that which accumulates the highest aggregate score over their two innings, as long as they can dismiss (get out) 10 players in the lower-scoring team's final innings. If they fail to do so before the time allocated (3, 4 or 5 days) ends, the game is drawn, i.e. a shared result. If the aggregate score of both teams happen to be exactly the same when the final wicket of the last innings is taken, then the game is tied -- this however is stupendously rare. See 'Results' section below. There are several shorter formats of the game, too, known as limited-overs cricket (an over is the unit by which cricket gameplay is most conveniently divided, being a sequence of six balls, bowled by the same bowler), where the match is played within a single day with a maximum of 60 overs or fewer per team -- as opposed to the hundreds of overs across which a multi-day match can spread. This is not generally long enough for an entire team to get out, especially in the twenty-over variant Twenty20, so it theoretically encourages more risk-taking, particularly in attempts at fours and sixes (see below). This gives the opportunity for faster play, ensures definitive results -- since it eliminates the draw by removing the requirement to dismiss 10 players, simply declaring whichever team scored the most the winners -- and tends toward the loss of fewer spectators to old age before the conclusion of a game. In limited-overs cricket, a tie can still occur if both teams are on the same score at the end of their allocated overs, resolved by a tie-breaker as detailed further down this page. All players bat, and all players field. The first batsmen in (the top-order) will be the best at that, while the lower order is usually composed of specialist bowlers who just make up the batting numbers, especially at the tail end. When the latter do manage to cobble together an innings of 20 or 30 runs, especially in partnership with a fellow tail-ender, it‘s often said that "the tail wagged" to frustrate the opposition‘s hopes of a quick dismissal. All-rounders are those prized cricketers equally at home with either bat or ball in hand, and any team loves to have at least one in the ranks as they essentially fill two roles for the price of one. For some reason they are often larger-than-life personalities, prone to swinging from imperious to anonymous and back on the pitch and partaking in all manner of off-the-field antics, but who invariably maintain their place in the team by coming into vital games at the crucial tipping point and causing destruction with their bowling before scoring a match-winning haul of runs, all while heroically drunk from the previous night‘s marathon boozing session. The examples here generally suggest male players, but women play as well in their own competitions; you just don‘t see it much in the media. Matches are played on a large grassed field roughly analogous in size to a baseball field -- so a big hit is likewise travelling the same sort of distance at the same sort of altitudes and speed, the fielders who are in deep (far 'outfield') positions have to cover the same sort of distances, etc. There is no set size or shape for the field in the laws of the game -- it may be roughly circular or more like a rectangle (Eden Park in Auckland is a hexagonal field) -- but an oval field about 150 yards in diameter at its widest is common. Many cricket grounds around the world have taken on a characteristic feel of play over the decades thanks to their various sizes and shapes (in two notable cases including a tree in the middle of the outfield), tendency to be kept with longer or shorter grass and hence to having slower or faster surfaces, plus their differing climates and altitudes altering the flight of the ball and style of player likely to flourish there, and so on. The perimeter of the field is marked by the boundary rope laid along the ground near the edge of the grass in front of the spectators. The quickest way to accumulate runs when batting is to smash the ball to the boundary with a mighty hit, as this means you don‘t have to actually physically run at all -- if the ball crosses the line of the boundary rope without having touched the ground at any stage that's a six, which is the nearest thing to a cricket version of a home run and is automatically worth (yes) six runs; if it bounces or rolls over the line, it's a four. If you've ever heard someone use the term "knocked for six" or "hit for six" to refer to being physically or emotionally stunned, knocked off their feet or otherwise struck with great force, this is where it comes from. Fours and sixes are collectively known as boundaries, after the place they‘ve been dispatched to. One-day cricket is relatively jam-packed with them, as players are encouraged by the limited time to go for rashly huge hits since quick scoring is prioritised and it doesn't matter so much if they're out off a bad stroke. Fours are fairly common; sixes are rarer and always very exciting, especially the ultra-rare instances where the ball is clobbered with an especially hefty blow clear over the pavilion (a marker of truly spectacular hitting at many a ground), or even sent sailing right out of the stadium so it must be retrieved from the road/car-park/gasworks/river, or when it is caught by the hitter‘s father in the crowd or something equally unlikely. The heart of the action is around the pitch, a narrow 22-yard long rectangular strip at the centre of the field, mown so short there‘s almost no grass to be found. This area is also known colloquially as the wicket – so a "sticky wicket" (it‘s not as obscene as it sounds) or "tricky wicket" is a damp, claggy, bumpy or otherwise unreliable pitch, and used as a metaphor means 'an awkward situation'. The two ends of the pitch each have a pair of widely-spaced parallel white lines painted across them, four feet apart, which mark the batsman‘s ‘safe‘ ground: an area known generally as the crease. Specifically, the inner line at either end is called the popping crease or batting crease; the batsman generally stands astride it to receive the bowling, and when running must get part of his bat and/or body over this line to be ‘safe‘. In the centre of each outer line (the bowling crease) is a group of sticks stuck in the ground that is also and most properly called a wicket, one either end of the pitch; these are the target for the fielding team and what the batter must defend, as many ways of getting a player out involve them. This is where we get the third use of the word: a batsman‘s intact wicket, used metaphorically, represents his 'in' status – i.e. if you "take X's wicket" you‘ve got X out; when a bowler has "taken 5 wickets" he's put five men out; if X "gave his wicket away cheaply" he's got out sloppily and/or without scoring highly (he hasn‘t actually presented it to someone); if Y has bowled down the wicket, destroyed the wicket and taken X‘s wicket that mean‘s he‘s flung the ball down the pitch, skittled the stumps and so got him out. The physical wicket is comprised of a trio of round wooden stakes called stumps, 28 inches high, hammered into the turf side-by-side and equidistantly with a total span of 9 inches, plus a pair of smaller wooden sticks called bails that sit in grooves across the stumps' tops and bridge the two gaps. (The whole thing looks faintly like a little gate, and indeed the name derives from a 'wicket-gate'.) Most commonly-seen forms of getting a player out dictate that the stumps must be disturbed enough for at least one of the bails to fall off -- merely touching the stumps with the ball is not enough, and it can in the rarest of circumstances actually squeak through the gap between stumps without dislodging a bail. This would generally press the bowler‘s Berserk Button...as will many other cricketing occurrences. The two batsmen stand at opposite ends of the pitch, garbed with large leg pads (think an ice-hockey goaltender) and gloves, batting helmets unless suicidally brave, and a protective cup ("box") unless they have no desire to have children. Instead of a round bat, the cricket bat is flat on one side (the reverse is more angled than round, too), giving a defined striking surface and making it ideal for hitting people who owe you money without leaving a bruise. The flatness also gives it edges, for cleverly/accidentally nicking the ball just past the close fielders or for when you do want to leave a bruise. (Or kill zombies. Shaun of the Dead had the right idea.) It is wider than a baseball bat, but considerably narrower than the wicket it is defending –- in the sport‘s Victorian days, one player took advantage of the lack of a regulation size to bring a bat wider than the stumps. This was quickly outlawed by spoilsport officialdom. One batsman (the striker) faces the incoming bowling, which comes down the length of the pitch, while the other (the non-striker) waits facing him by the other stumps, trying to keep out of the bowler‘s way. The striker prepares to meet the incoming ball with the end of his bat resting on the ground to defend the wicket there (rather than held up at shoulder height as in baseball), or more usually tapping nervously as he anticipates his swing. He tries to fend the ball away from his stumps with his bat, and preferably hit it far enough for him to swap ends of the pitch with his partner and so score a run (which counts only to the striking batsman's tally, not the non-striker's) one or more times before the ball arrives back near either set of stumps with the bowler or the wicketkeeper (backstop, essentially), the specialist fielder who stands behind the striking batsman‘s wicket to catch missed balls and is the only member of the fielding side to wear gloves. After this it's not prudent to try for another run as you'll certainly be run out: see 'Getting out', below. One of the principle differences from baseball, say, is that instead of sprinting around four bases, the two batsmen run up and down the pitch from one crease to the other to score, passing in the middle. They carry their bats with them from end to end. This is so the batsman may defend his honour while running. Another difference of course is simply that after you score a run, instead of leaving the field, you can keep running back and forth -- after all, one ‘run‘ in cricket is much swifter a process than making it back home in baseball/softball -- until the two batsmen agree it‘s not worth risking another, at which point whoever is left facing the bowler receives the next ball. In practice, the batters usually run one or two, and occasionally three, before the ball gets back from the outfield to the bowler or wicketkeeper's hand. Thanks to this relatively easy scoring, team totals almost always reach triple figures; anything lower is regarded as catastrophic at the upper echelons of the game, while 200-300 is a solid team score and 400+ is really putting down a target. Since high scores take a long time to accumulate, limited-overs tallies rarely approach 300 from 50 overs or 200 from 20 even in the accelerated environment of these kinds of matches. A team‘s total is often described en route in terms of partnerships, i.e. the tally accumulated while the current pair of batsmen have been at the wicket. So a "century partnership" is when a single pair score 100 runs between them without the loss of either‘s wicket; an "unbroken partnership" is when they continue to the end of that innings‘ allotted time without being separated. The tallies acquired between each player‘s dismissal are likewise referred to as being "for the nth wicket", e.g. the opening pair of batsmen might "put on 80 for the first wicket", while the 11th man comes in for the "last-wicket partnership". When you ask the score of the match (game), people will unhelpfully tell you something like "They're 170 for 5 right now" instead of just telling you the scores of the two teams. It means that the team at bat have scored 170 runs while losing 5 wickets, and is written 170-5 or 170/5. To make things more confusing, in Australia (but not New Zealand) it will be "5 for 170" instead, presumably because their toilets run anti-clockwise (counter-clockwise/widdershins). The other main difference from other bat-and-ball sports is that you don‘t have to run. The batsman is never obliged to attempt to ‘get to the next base‘. This is probably the most important thing a baseball fan would need to know in order to grasp the difference in dynamic between that sport and Test cricket, as it is almost never mentioned explicitly. Simply put, if a batter hits the ball weakly, swings and misses, diverts it into his own stomach, blocks it dead in front of him with the proverbial "straight bat", or merely watches it fly wide of the stumps in a contemptuous fashion, he just stands there. He can do this for as many balls as he wants, progressively infuriating the bowler; and indeed many old-school cricketing greats made careers out of this practice, usually finishing the innings with figures like 46 runs scored in 312 minutes off 227 balls. This has caused consternation to many a cricketer‘s teammates, too, as this seems to happen much more after the lunch breaks. Limited-overs and especially Twenty20 cricket (see 'Game formats', below) are designed to cut down the practice, as you don‘t have all day to waste there plus each run tends to be more valuable, so batsmen must often chance a run even off a less-than-satisfactory hit. In cricket a batter doesn‘t have to keep his feet still and can advance to meet an incoming delivery, so he can steal a yard or two by moving quickly forward onto a ball as it bounces, and by nudging it only a few yards he can be off and halfway to a scrambled single (one run from a ball) before the nearest fielders (who may not have expected him to run) have started to move in to retrieve it. On the other hand, if he‘s deceived by the ball's flight and/or spin, he can easily find himself stranded out of his safe ground and turn around just in time to see his bails being removed from his stumps. A textbook example of the way multi-day matches can lend themselves to inaction is the England v West Indies 1st Test match in May 2012. The first WI innings began with just 13 runs being scored from the opening 8 overs (48 balls) while the batsmen tried to get used to the conditions, the surface and the movement of the ball. With 12 of those runs coming from three hits for four, the batsmen did not actually run to score until the 48th ball, which saw the first single of the match finally taken. (Up until this point the batsmen had not changed ends -- so with the same two bowlers alternating overs from opposite ends, either batsman had received four complete overs, 24 deliveries, from a single bowler each.) Many of the 44 non-scoring balls were left altogether by the batsmen, not even attempting a shot. The lone single meant that they swapped positions for the ninth over, and the batsman now facing a different bowler was promptly bowled by him a handful of balls later without adding to his score. A batsman getting out for zero is said to have scored a duck (possibly because '0' looks rather like an egg), an amusingly embarrassing scenario only amplified if it happens on his first ball, known as a "golden duck" -- or if he suffers the mortifying fate of a "pair", ducks in both innings in a match. An individual player scoring a fifty or half-century will generally pause to acknowledge the crowd and teammates‘ applause with upraised hand and/or bat, while one player scoring 100 runs in an innings -- a century -- is always a rapturously-greeted achievement that often sees the centurion remove his helmet, shake hands with his colleague at the crease and bask in the acclaim of the spectators for ten seconds before getting back down to business. Double-centuries are much rarer, and may see even the fielding team join in the congratulations; triple- or quadruple-centuries are surpassingly rare at Test level especially. The world record is held by West Indian great Brian Lara, who scored 501 not out in 1994 for his English county side Warwickshire. Lara also set the world Test record of 375 the same year, eclipsing Sir Gary Sobers' mark of 365 not out that had stood since 1958; when this was finally broken in turn in 2003 Lara went out again in 2004 and scored 400 not out to set a still unbroken second record. The bowler sends the ball down six consecutive times from the same end of the pitch (one over), in theory aiming for the batsman's stumps each time: that is, he's not trying to strike the batsman out, but principally looking to hit the wicket with the ball, causing it to fly apart with stumps cartwheeling in all directions. That, or to smack the legs of the batsman when they‘re directly in front of the stumps (see section on getting out, below), or even to tempt him into making an unwise shot, resulting in getting caught out. After six such deliveries of the ball the over is, um, over and it‘s time for another bowler to have a crack from the opposite end. This means that if the batsmen didn‘t run off the last ball or if they scored an even number of runs, the non-striker will now be facing the new over: he comes on strike. As it's perfectly possible for one man to remain in while a whole succession of his partners get out, and the quality of batters tends to decrease down the team -– the openers are invariably among the best, while extreme tail-enders at No.11 can look like they have trouble working out which way up to hold the bat –- the latter stages of an innings can see two batsmen of contrasting ability at the crease (in); so in this case the better one may look to "farm the strike" by going for single runs (or 3s, if they're prepared to sprint like crazy) off the last ball of each over so as to swap ends to face the next over too and protect his weaker colleague. No bowler can bowl consecutive overs, so there must invariably be at least two bowlers, and except in very bizarre circumstances there will be four or more, usually taking turns as one after the other tires or conditions change to suit a different style of bowling, such as pace, swing, reverse swing, seam, off-cutters, leg-cutters, off-breaks, leg-breaks, googlies, chinamen or doosras. (These are all real.) A captain often rotates 4-6 bowlers over the course of an innings depending upon the appropriateness and/or success of each. If one really gets into a groove though he may end up bowling virtually 50% of the total on his own, anything up to 80-100 overs in the course of a long innings. Shorter forms of the game tend to discourage this by restricting the number of overs that a bowler can bowl in an innings: for example in a 50-overs match each bowler can bowl at most 10 overs, so a team needs a minimum of five bowlers. In the Victorian early days of the sport, bowlers really used to use an underarm 'bowling' action, though nowadays the arm is brought over the shoulder almost vertically -- originally under- and side-arm bowling were the norm, and ladies‘ teams actually changed first to overarm bowling on account of the fact that they kept whacking their hands on their skirt hoops painfully. Bowling underarm is frowned upon nowadays...especially when it‘s the last ball of the innings and the other side needs to hit a six to win, as it‘s functionally impossible to generate enough power on a ball arriving low with hardly any momentum. Underarm bowling has actually been banned in one-day cricket; it‘s still technically legal in Tests, but nobody ever does it. The most famous incident occured in 1981, causing quite a stir. It should be noted that the ball in question was more of a lawn bowls throw than a proper underarm cricket bowl. Proper underarm bowling bounces and turns just as much as overarm bowling, so you can hit a six off it. Whatever the angle of his or her arm, the bowler doesn‘t throw the ball like a pitcher; in fact, "throwing" is outlawed in this position, as the law says that the bowling arm must be kept almost straight while it delivers the ball rather than flexing at the elbow. This naturally greatly reduces the velocity the bowler can release the ball at, so he is allowed a run-up like a javelin thrower to gain momentum. The length and pace of this depends on the type of bowler: a slow or spin bowler may take relatively few steps, but a really fast bowler will come thundering in from forty yards away like an angry windmill and send the ball down at over ninety miles an hour. He must release it before his leading foot crosses the bowling crease (the line level with the stumps at the non-striker‘s end of the pitch), so if he oversteps a no-ball is promptly called by the umpire, adding one extra (sundry) to the batting team‘s score -– plus enabling the batsman to have a quick free hit as he can‘t be out off a no-ball (except by being run out; see below), plus meaning that ball has to be bowled again. Like a tennis server, the bowler doesn‘t have to remain behind his line once the ball‘s on its way, so in the case of a fast bowler he may well careen halfway down the pitch or more with his follow-through, ending up glaring intimidatingly into the eyes of the batsman from a few feet away. This is not completely inadvertent. The idea is not to hurl the ball directly at the batsman -– although this can happen, which is known as a full toss, an enjoyable Double Entendre in Britain. Rather, the bowler aims to bounce the ball once on its way to the striker. Varying the speed of his deliveries, the spin and swerve on the ball and taking advantage of the vagaries of the surface where the ball pitches (lands) allows the bowler to have many more weapons in his armoury than a pitcher, as he looks to bamboozle the batsman into either missing the ball entirely, deflecting it to the wicketkeeper (who is already in line and generally closest) or mis-hitting it to the other fielders, who will catch the batsman out if they take it before it bounces. The ball does have to go near the batsman, to give him a fair chance; if an umpire deems the ball has been bowled too far wide of the stumps to be reasonably reached (a yard or so, or less if it's behind the batsman's legs), it‘s inventively called a wide, which like a no-ball adds one to the extras tally and requires a re-bowl. There are a number of other ways to get a batsman out here, but catching and stumping (detailed below) see the wicketkeeper as the bowler‘s chief partner-in-crime. (This is the origin of the British slang for the dominant and submissive parties in a homosexual relationship, "the bowler" and "the wicket keeper".) He has to be equally as alert to sly deliveries as the batsman is, since if the ball flies past the bat and then past him too, it may end up far enough away for the batsmen to take a run or more regardless – these cheeky non-hitting runs are known as byes (possibly from what the batsman used to shout as he set off) and also go onto the extras column. In particularly embarrassing cases the ball may go all the way through to the back boundary for four byes. The fourth and last source of extras is a variant on the third – if the batsman judges the ball is not going to hit the stumps he can deflect it away with his leg-pads without using his bat, and score leg-byes if this creates the chance to change ends. This requires confidence, as a bad judgement call can result in the batsman being given out leg before wicket if the umpire decides the ball was on line for the stumps after all. The many styles of bowling delivery possible mean that different bowlers specialise in different forms. Fast Bowlers mostly use the pace on the ball to beat the batsmen. They may deliberately bounce the ball high towards a batsman‘s head to unnerve him (called a bouncer -– not popular with umpires; numbers of these per innings are limited by a sort of gentlemen‘s agreement, as being cracked repeatedly on the skull by a small cannonball at 80mph is not fun), or in extreme and allegedly unintentional circumstances fling it directly at his head (a beamer, very much frowned upon), or try to aim the ball to bounce directly under his bat (called a yorker –- incredibly hard to play if done correctly, but delivered wrongly can result in easy runs). Fast bowlers will also often use curveballs (called swing in cricket) to deceive an opponent –- however, the mechanics of why the ball curves are different: cricket balls are deliberately kept shiny on one side (by the bowler rubbing it vigorously on his trousers, usually near the groin, which looks decidedly dubious) and rough on the other to create additional motion in the air. Most teams will begin a match with two fast bowlers in an attempt to get early wickets if they can establish a good line and swing; however once the batsmen are settled in and comfortable the extra pace does not bother them so much, so the bowlers will often by replaced by tricky spin bowlers. The fast bowlers will then come back at the end with a view to quickly wiping out the other team‘s tail-enders. Medium Pace Bowlers are like fast bowlers but without the raw pace, instead they will often vary their delivery more and try and outwit their opponent. A medium pace bowler is more likely to use seamers and cutters, which bounce the ball on its stitched seam to create unpredictable effects. As they are often the most precise bowlers, medium pace can sometimes be used in the middle of the game to slow down an opponent‘s run-scoring rate; however they are generally less likely to take wickets than a fast or spin bowler. Spin Bowlers are the slowest bowlers on the pitch (much slower than a pitcher) but deliberately spin the ball in the air, causing it to change direction when it bounces and confuse the batsmen. Spin bowling comes in two main types, off spin and leg spin, and a bowler will usually specialise in one or the other. "Off" and "leg" denote the left and right halves of the cricket field from the bowler‘s point of view. These are named from the direction the on-strike batsman is oriented when he‘s receiving a ball, given that his body is sideways-on to the approaching bowler -– the leg side (also known as the on side) is the half the batsman‘s legs are on, which his bottom is pointing towards, while the off side is the half the batsman‘s bat is on, which his nose is pointing towards. Leg-spin bowling angles in from his leg side, off-spin from the off side. Many fielding positions are named in the same way, so a player fielding on one side of the batsman may be at mid-off while a teammate in the equivalent position across the field will be at mid-on. One of the more perplexing aspects of cricket nomenclature is that these field halves are purely defined by the orientation (so to speak) of the batsman -- but naturally a left-handed batsman will face the opposite way, with his legs to the left and bat to the right from the bowler's perspective, so the ‘off-‘ and ‘on-‘/‘leg-‘ sides swap accordingly; a fielder at what was mid-off will, without moving, have assumed the position of mid-on to a left-hander. An off-spinner grips the ball normally and spins it with his fingers on release so it turns right on bouncing, in towards a right-handed batsman's body (terminology for spinners becomes confusing when left-handers are involved, so we‘ll stick to the basics). Off-spin is hard to read and will often put the batsman on the defensive. Leg-spinners (also called wrist spinners) deliver the ball in a similar way but also twist their wrist as they release the ball, causing it to angle leftward on the bounce, away from a right-handed batsman. A batsman who fails to read this sort of spin will often make a bad hit and give the fielders an easy chance to catch him out. A wrist spinner can also deliver a googly, an evil delivery that uses a complex wrist motion to cause the ball to turn in the opposite direction, as well as deliveries that use top or bottom spin to bounce unexpectedly high or low. This varied arsenal of deliveries makes leg-spinners some of the most dangerous bowlers a team can field; however the high difficulty of the skill means that although they take many wickets, they also concede many runs. An underperforming leg-spinner can be disastrous for a team -- making using them a high-risk, high-reward strategy. Just to make things extra confusing, the captain of the fielding team will usually rearrange his fielders to reflect the kind of bowler he is using -- i.e. whether the bowling tends to create chances of catches on the boundary or close in to the wicket, in front of or behind the batsman, etc. -- as well as what hand the batsman uses, or how good the batsman is. In some cases this can result in the fielders constantly moving around as the batsman or bowler changes. The fielders may appear to be scattered randomly around the playing surface, but in fact there is a long-established and fairly scientific method to the madness, with each position properly defined. 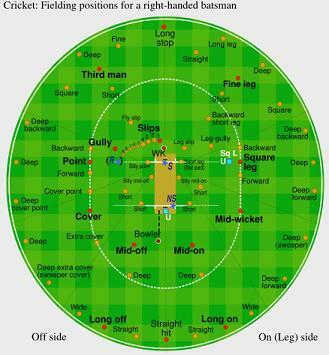 There are far more theoretical fielding positions than a team could possibly cover all at once: many are typically only filled in an attacking field, with more fielders in close to the wicket when the ball is new, the bowlers are hungry and the batsmen are nervous; while others are more typically occupied in a defensive field when the bowlers are tired, the batsmen have got their eye in and the ball is flying to the far corners of the ground with regularity. Many fielding positions, on the other hand, have titles whose meaning is buried deep in the quicksand of jargon. These positions have names that range from the mildly bizarre (gully; cover point; third man) to the literally "silly": there is a whole set of places with names like silly mid off that generally involve standing closer to the batsman than prudence would dictate. In fact, fielders in "silly" positions (especially silly mid on) will occasionally bring out a baseball catcher-type mask to avoid ending up with a broken nose or eye socket. See this video to get an idea of exactly how silly these positions are. It is worth noting that the victim in the above video is the captain of the Australian national side. A cricket ball weighs about 5.5-5.75oz and is rock-hard, so it‘s a bit like being hit by a ball bearing. Ponting must have been having an off day, normally he would have caught that. Of course, positions are not kept-to rigidly. Fielders are chasing balls all the time, particularly in the outfield, so a player who starts at deep fine leg could easily run fifteen yards and be said to have caught a batsman out at deep backward square leg, say, even if no-one were nominally stationed there. Also, all this nomenclature can be subjective, depending upon where you draw the borders for any given position: one man‘s silly mid on is mere inches away from another‘s forward short leg (oo-er), if one considers the latter to be a closer-to-the-bat position than others might. Still another person, if they come from a different country or region or simply if they prefer a different classification, might call the same area "short midwicket". Don‘t worry about any of this. Since the batsman has a 360-degree field to strike into rather than a 90-degree one, doesn‘t have to hit the ball within 3 attempts or be out and doesn't have to hit the ball into the air to score runs, plus no one (except the wicketkeeper) uses gloves, it‘s much harder to get a player out than in, say, baseball; hence the need for up to 5 days to complete a single match. This is not a slur on catching talent -- a talented fieldsman can run 20 metres, and catch a flying ball with one hand without slowing down without needing a glove. They just don't necessarily get the chance very often. That "talented fieldsman" was India's Sachin Tendulkar, who also happens to be the best batsman in the world at this moment, is acknowledged as one of the finest players in history, and in March 2012 uniquely scored his hundredth century in international cricket. No biggie. A fielder catching the ball after it strikes the bat and before it hits the ground -- caught out. If the bowler makes the catch off his own bowling it‘s listed on the scorecard as "caught and bowled", otherwise "caught [by] Fielder Y, bowled Bowler Z". Wicketkeepers tend to amass the most catches thanks to their proximity to the bat; this is commonly known as "caught behind". In casual games, especially those involving kids, it's pretty common to include a rule called One Hand, One Bounce. Basically, if it bounces once but is caught one-handed, the batsman is out. Being tagged out at the base. However, since cricket doesn‘t have bases and the British don‘t like personal contact, it actually involves throwing the ball at a wicket causing it to fall apart, while a batsman is out of his safe ground. This is called a run-out, as it usually occurs while the batsmen are running, and frequently results in contentious decisions (now settled at the game‘s higher levels by an extra official watching a video replay) as the batsman dives full-length for the crease with outstretched bat at the same instant as the ball strikes the stumps. Crucially, this can happen at either end of the pitch, if the fielding team make a successful shy at either the striker or non-striker's wickets –- this can produce acrimony among the batsmen if one tries to push for a run and the other doesn‘t, or if one turns back midway so both are momentarily trying to get to the same safe ground, as if the fielders successfully "put down the stumps" at this instant then either man is arguably the fall guy and they‘ll have to argue it out between them who walks back to the pavilion. Run-outs can follow truly dazzling pieces of fielding as the most talented (or lucky) fielders can occasionally score a direct hit on the stumps from as far afield as the boundary. Strangely though, on the scorecard a batsman is listed as simply "run out", with no bowler or fielder credited. Being stumped, which is when the batsman wanders away from where he‘s supposed to be (effectively steps out of the batter's box, i.e. out of his safe zone), and is then tagged out by the wicketkeeper striking the stumps with the ball held in hand. This usually happens when the batsman steps forward to meet a delivery, misses it, and the wicketkeeper catches the ball and instantly breaks the wicket with it before the batsman can get foot or bat back in his crease. The distinction between a run-out and a stumping is that the former is done when a run is being attempted, the latter when not (and can be done only by the wicketkeeper). This is sometimes important as the batsman cannot be stumped off a no-ball and cannot be given "run out" if it would have been a legal stumping otherwise. The mechanics of actually breaking the wicket is the same in both cases and, rarely, a batsman has been stumped by a 'keeper who was out of arm's reach but threw the ball at the wicket. Time-Wasting (which no batsmen in the history of test match cricket have ever been dismissed for). The only form of getting out that is seen with regularity aside from the first four above is leg before wicket (LBW), which basically involves the batsman blocking a ball that would have otherwise hit the wicket with his leg and the opposition hence appealing for his dismissal. Working out whether the ball was heading on line for the stumps or not though may involve a television replay, an extraordinarily powerful computer, some tarot cards, and up to several million people around the world providing their two pence-worth of opinion. Just to make it more complicated still, the ball hitting the batsman‘s leg can be treated as an ordinary hit and used to score leg byes as described above, if the umpire thinks it wasn‘t LBW, and can be really painful depending on whether you‘ve got decent (or any) pads on. It is traditional for the bowler to appeal by politely asking "How was that?" of the umpire -- in practice, by the bowler and any other enthusiastic (i.e. all) team mates screaming "HOWZAT!!!" (invariably pronounced "OWZAAAAH!" or in Australia "ZHAAAAART!") at the umpire if they think they have an LBW shout. Or if the ball was vaguely bowled in the direction of the wicket and hit the batter‘s legs. Or bat. Or the ground at their feet. Or missed them entirely. This overoptimism backfires if they annoy the umpires with it, as the umpires are likely to get their own back when LBWs actually happen. The eleventh of the ten ways is when particularly tired batsmen who are bored of humiliating their crap opposition may simply be retired out to let one of their mates have a go. Only ever happened twice in a Test, and both in the same match (when Sri Lanka were whomping Bangladesh); slightly more common in lower-grade games. It is also possible to "retire hurt", if a batsman is injured during a game. This is an interim status so long as the innings is going on, since a recovered batsman may return later when a subsequent wicket falls, but if unable to do so then the innings ends when the last partnership of fit players is broken. As previously mentioned, there are several distinct forms of cricket match, which vary by length and hence tactics. All are played over the course of each season, with separate competitions using the separate varieties. Clubs (teams) may vary some of their players for each form, depending on which format(s) the player excels in. As noted, the ‘standard‘ form of the game features two innings per side, played out over a leisurely four (county) or five (international) days. Something exciting happens about once every two hours. At other times, the commentators – especially on Test Match Special on the radio – will usually be talking about the cake that a listener has sent them, or J.W.B. Blenkinsopp‘s exploits in the equivalent encounter in 1936, or what species the bird that‘s hopping across mid-off is. Spectators can safely doze off in the sun, or wander off to the bar or for a picnic, for up to several hours without being in danger of missing much significant action, particularly in the opening days of the match. -- if the chasing team does succeed in reaching their target, play stops immediately and they are said to win by however many wickets they still have in hand out of their 10 -- e.g. if they have lost seven players before reaching the target then "Team Y beat Team X by three wickets". A match can end after a mere three innings, if one team scores more in one go than their opposition manage in two attempts -- they may bat second and rack up so many more runs than the first team managed, the opponents end up coming in for their second innings and failing to catch up on aggregate even after batting again. The result will be given in the form "Team Y beat Team X by an innings and 19 runs". In a case where the team who batted the opening innings of a match next proceed to dismiss their opponents for an embarrassingly low percentage of their total, they can twist the knife by "enforcing the follow-on" -- flaunting their vast superiority by making the demoralised opposition bat again straight away. If the team following-on fail to catch up even after their second go around, then an "innings victory" as above will be the result; the hope for the side doing the enforcing is that even if they do have to come back to bat again themselves, the target set after the hapless opponents have finished their second innings should be rather negligible. A team following-on and winning has happened only three times at Test level. All three times the losing side was Australia: once against India, and twice against England -- including an astonishing 1981 encounter since dubbed the "Botham Test" after the aforementioned all-rounder's exploits. Crucially, the system for deciding results is open to tactical abuse as, given the difficulty of completely bowling out the other team twice over, there is so much opportunity to draw (tie, though that term means something specific in cricket: see below) a match. This is an English game, after all, with none of that competitive North American insistence on an unambiguous result with winners and losers. If the full 4 or 5 days are played without both teams being completely dismissed (got out) twice -- which is a common enough occurrence, especially if the weather eliminates chunks of playing time -- the match ends in a draw with honours even, regardless of the discrepancy in the two sides‘ scores at this point. It is quite possible for one side to have scored, say, 400 and 300 runs in their two innings, but for the second team to gain a draw after scoring 250 in their first and hanging on at -- for instance -- 180-7 (180 for 7 wickets) in their second when time runs out. So if a side enters the last day or hours having been comprehensively outplayed and still hundreds of runs in arrears on aggregate, they can abandon all attempt at actually catching their target and simply "play for the draw", grimly clinging on to their last wickets and stonewalling everything thrown at them, hardly daring to go for a run, while the crowd either grips the edge of their seats or gives up and goes home, depending upon allegiance. In extreme circumstances, one side may see its final pair of batsmen, usually specialist bowlers with only the haziest grasp of batting mechanics, pinned to the crease like terrified limpets while their furious opposite-numbers unleash an ever more titanic bombardment as the final minutes of play tick away, until either the stumps or the bowlers‘ sanity are finally shattered. Successfully pulling off this trick shows how the game can reward dogged tenacity as much as flair, as the apparently outclassed side will withdraw from the fray battered and bloodied but with a share of the spoils. If a team is lazy and winning, they can just stop batting and end their innings early. This is officially known as declaring, and their score will read something like "324-6 declared" as opposed to "324 all out". This is most often done as a pre-emptive counter to the above strategy, when the captain of a batting team that is doing particularly well feels his side have already established enough of a lead, and hopes to force a result by giving themselves enough time to hopefully bowl the opposing team out before time expires. After all, there‘s little point in setting a mammoth target like 638 by lengthily compiling 500-odd runs in your second innings, if by the time you‘re all out it‘s late on the final afternoon and the opposition only need to bat out a dozen overs to secure a draw... So the captain may choose to call a halt as soon as an incumbent batsman has reached their century, perhaps, or the next wicket fallen, or simply a round-number gap opened up. Exactly how soon the declaration is made, though, is a trial of confidence; or as TOW puts it, "A captain considering declaration must balance the risks of declaring too early (thus setting too low a target for the opposing team) against those of declaring too late or not at all (thus causing a draw by leaving insufficient time to complete the match)." If a team manages to rack up such a vast score at the start of a match they feel able to declare in their first innings, then obliterate the opposition for such a meagre tally they are also able to force the follow-on, then do so again for an innings victory... well, that's about as close to a Curb Stomp Battle as cricket gets. In the case of a draw, both teams will line up in a scrum for a penalty kick-out. Although in most sports "draw" in British English and "tie" in North American English refer to the same thing, i.e. a shared result, there is also a distinct tie result in cricket, although such an occasion is rare. This is when both sides have ended up on precisely the same total score at the close of the final day‘s play, or, in a one-day match (see below), after the last ball of the second team‘s innings. Since hundreds of runs are usually scored per innings, exactly matching a team‘s aggregate in a multiple-day match is particularly improbable -- especially so in Test cricket, where there have only ever been two matches that ended in a tie (Australia vs West Indies in 1960, and Australia vs India in 1986), requiring an unlikely combination of scores like the West Indies tallying 453 & 284 to tie with Australia‘s 505 & 232. There are also two equally-rare cases of a drawn Test where both sides happened to be on level aggregate scores when time ran out, without the last batsman having been dismissed. In November 2011 the West Indies (590 and 134) drew with India (482 and 242-9), which saw the teams on 724 each after the final over; prior to the last ball either team could have won, or the game been drawn, or tied. The sole previous occurrence saw Zimbabwe vs England totalling 610 each in December 1996. If you cannot handle the sheer exhilaration, tension and shifting fortunes of four or five days of concentrated play, there are the one-day matches too. Here both teams have just a single innings and bat for only a limited number of overs -- often fifty, but sometimes sixty or forty depending on the competition and what period of history we‘re talking about. If the second team batting fails to catch the first team‘s score by the end of their allotted overs then the first team wins; if the second team do catch up then play stops there and they win. Simple. Thus, the game can turn into a race against the clock as the second side attempt to beat the other team‘s score before they run out of overs. This is regardless of how many players get out -- a side that bats carefully and amasses 100 runs for the loss of no wickets at all (100-0) will still lose to a side who bat in a cavalier yet faster-scoring fashion and score 101-9. Used for knock-out cup competitions in Britain, as well as a separate One-Day Championship league. The newest trend in the "limited-over" game is the especially whizz-bang twenty-twenty format (known as Twenty20 or T20), where each team bats for only (you guessed it) twenty overs – the idea is to encourage dramatically big hitting and kamikaze running as there is such a brief time available for scoring. A match can be completed within a single afternoon. This version of the game has grown rapidly huge commercially in India (a hotbed of world cricket) in particular, where the nascent yet lucrative IPL (Indian Premier League) has revolutionised aspects of the sport, but the British game has also added T20 competitions to the annual calendar. There are still people who do not accept limited overs matches (especially Twenty20) to be ‘real‘ cricket. Do not get involved in a discussion on this subject unless you really want to talk about how great Test Cricket is for several hours -- especially with anyone who has played Test Cricket, is ‘of a certain age‘, or is a TV or radio commentator. If it rains during a limited-overs game, instead of just calling the whole thing off you get into something called the Duckworth-Lewis Method, a technique for reading chicken entrails that will find out what should happen next. The idea is that this sets the batting side a revised target, based on a.) the reduced number of overs it‘s still possible to fit in after the weather delay, and weighted according to b.) the number of wickets they have left -- i.e. it tries to predict what score the team would have reached given how fast they were scoring so far and how many wickets they have in reserve, and essentially asks them to keep scoring at the resultant calculated rate. For example, if the set target was 250 off 50 overs, and rain reduces play so there‘s only time for 40 overs, the D/L target might be 200 off 40 as would seem proportionate -- but such a simple figure is unlikely in practice, and the sophisticated weightings applied would be more likely to produce a target like 181 or 207. No-one really understands how this works, apparently not necessarily even the players, therefore it can be often controversial and applied incorrectly: most recently when a West Indies captain called his team in, thinking they‘d win by one run, but instead lost by two runs to England -- having not realised that his side losing a wicket to the last ball before the stoppage had altered the weighting. Since the method is headspinningly unfathomable even to top-level professional exponents of the sport, don‘t worry yourself about it any further. In the rare instance of a tied one-day game in a knock-out competition, a result can be forced by a bowl-out/bowl-off -- a relatively recent innovation akin to a penalty shootout in football (soccer), where five bowlers from each team take turns bowling at an undefended wicket once or twice each, with whichever side gets the most hits winning. This sounds not unlike Blatant Lies but is actually genuine. Even more recently, however, this has mostly been replaced by a "Super Over", where each team is given one more over to score as many runs as they can. Most countries that play international cricket matches against each other do so on an irregular basis, jetting off a couple of times a year on foreign tours that will take in a series of Test matches, 50-over One-Day Internationals (ODIs) and now Twenty20 games against their host country, plus usually an assortment of one-day games against that country's provincial/regional/county teams, perhaps the national B-team, and maybe an invitational side or two. Given the propensity for draws in multi-day cricket, it's quite possible to end a Test series 0-0, which, despite sounding like a complete non-event, surprises nobody and sends everyone home happy at least. The oldest and fiercest international rivalry is between England and Australia: manifested in the biennial (on average) battles for The Ashes, where one of the planet's great sporting wars is waged for probably its smallest trophy, across five Test matches. The cricketing version of baseball‘s World Series or soccer‘s World Cup is (also) called the World Cup and involves countries you don‘t know anything about (Sri Lanka) in matches against countries that don‘t exist (West Indies), with the numbers made up by countries that are actually more like states or provinces (England). Most of the ‘big names‘ are Commonwealth nations, i.e. former members of the British Empire who learned the sport from their former colonial masters and now often play it better than them, but there is increasingly a global spread. As opposed to the World Series, which is only played by 1 1/2 countries. Although the World Baseball Classic, created by the American and Japanese professional leagues, was last played by 16 countries, or 15 if you don‘t recognize the legitimacy of Taiwan/The Republic of China/Chinese Taipei. There are currently only World Cups for the One-Day International (50-over) and Twenty20 (20-over) forms of the game. A Test World Cup was tried once, but rather predictably failed...we think. Some people say the matches might still be going on. Australia: Along with England enjoys a status as the first Test-playing nations. England: Includes Wales but not Scotland (who have their own team) or Northern Ireland (who form an all-Ireland team with the Republic of Ireland). South Africa: Suspended from international competition between 1970 and 1991 due to apartheid, but quickly became a formidable team once the ban was lifted. West Indies: Not a single nation but an alliance of several Caribbean nations and British Overseas Dependencies. See the other wiki for the full list. Nicknamed the "Windies". New Zealand: Seems to vary heavily between world-class and awful. Much, much stronger in the shorter forms of the game. India: Included Pakistan and Bangladesh before partition. The growing powerhouse of the sport, and home to the aforementioned Indian Premier League T20 competition that includes major international players as well. Pakistan: Included Bangladesh before it gained independence. Sri Lanka: Not added to the roster until 30 years after Pakistan, but a notable cricketing power. Zimbabwe: Suspended for several years recently due to political issues, but returned in August 2011. Bangladesh: Newest Test Nation, added in 2000. Kenya has been proposed as another Test nation, while Ireland and Afghanistan have announced their intention to attempt to achieve Test status. Test kits are all white, while One Day and Twenty20 uniforms are garish colours. Luckily, none nowadays are as bad as the West Indies‘ pink and New Zealand‘s beige pyjamas from the ‘70s and early ‘80s. There is a complex method for scoring the game at home that involves cryptic abbreviations and massive amounts of beer (flat piss/bitter). It generates all manner of vaguely relevant statistics, ideal for nerds to obsess over for ever. The game lasts much longer that it needs to, ranging from the Twenty20 matches that last a couple of hours too long, but can have cheerleaders if you like that sort of thing, to Test cricket, which lasts days too long). The batsman is sometimes hit by the ball. But because the English are real men, this is a perfectly legitimate thing for the bowler to do. Bowlers frequently target lower-order batsmen in particular with short-pitched, steeply rising deliveries, sometimes called 'up the throat', that would be easily avoidable were the batsmen concerned any good, with the result that many are hit (as they don‘t get out of the way) or panic and get out. If hit there is no penalty. They cannot use this tactic too much or it is considered intimidating in an unsportsmanlike fashion. This tactic led to one of the most infamous events in the game when England used it for the first time against Australia in 1932, named afterwards the "Bodyline" Series after the moniker this style of bowling acquired. It caused a diplomatic incident between the two countries and led to a change in the rules regarding fielding. As a footnote, the 'Windies' used the same tactic against the same England team in 1933, and England still won. And had a massive whinge. Only after that series were the rules changed. Not that it matters since, as with all sport, any game the English can play, Australians can play better. It‘s a fact! A fact that got completely annihilated this year. See The Ashes. Instead of ball boys there are bat boys, which sounds really awesome but is pretty much the same. You will never ever hear the name actually used during any game. Understanding a single word of all the above, and thus having the faintest idea of what‘s going on at any point during the game, is not actually a requirement for enjoying cricket as a spectator. Trust us, this game is far better than it is made to sound! Like all good sports cricket has (as you may have come to realise) its own highly bizarre language of convoluted terms. The Other Wiki has a very good list here. David Morgan-Mar (of Irregular Webcomic fame) has also provided a comprehensive, comprehensible and highly informative cricket page here. Another great site for everything and anything cricket related is http://www.cricinfo.com. Incidentally, a more accessible version of cricket is Beach Cricket (or Backyard Cricket), played all over Australia, New Zealand and the West Indies -- and in Britain too, only there‘s not nearly so many sunny beaches. It requires a cricket bat (of any material: can just be a stout piece of wood), a tennis ball or similar, fellow players and/or a dog to retrieve the ball, and pretty much anything can be substituted for the wickets. (Wheelie bins are particularly popular, at least in Australia. They make a satisfying "thunk" when you hit them.) The goal is to make sure everybody gets a turn at both batting and bowling, though fat Uncle Brian will usually sit out the fielding. You have two sides, one out in the field and one in. Each man that‘s in the side that‘s in goes out, and when he‘s out he comes in and the next man goes in until he‘s out. When they are all out, the side that‘s out comes in and the side that‘s been in goes out and tries to get those coming in, out. Sometimes you get men still in and not out. And here's the field diagram in video form courtesy of ‘‘No Reservations‘‘. Waldorf: You know, after reading that Cricket isn't really that hard to understand. Statler: Indeed, I now understand perfectly why we fought a war to get away from people who would find it entertaining. ↑ The incredible swing that can be achieved with the ball when conditions are overcast (that is, most of the time) can be a great boon, and the sudden changes in local weather conditions and the effect on the ball really helps keep things interesting. Usually. That said, cricket had been around for hundreds of years before swing, or indeed overarm, bowling was invented. This page was last edited on 23 February 2015, at 04:01.